The Sunbeam Photograph Ltd. company was started by John Milton Worssell, with help from Frederick Lewis Pettman (Mayor of Margate 1932-1934), circa 1919. 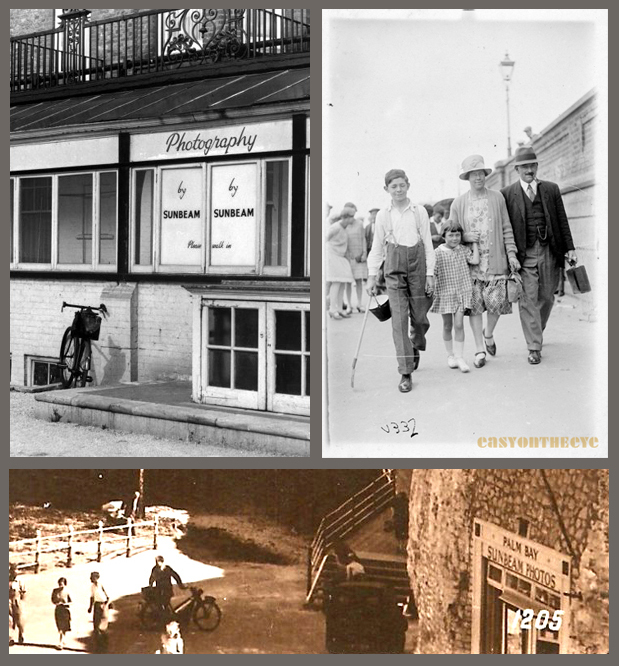 As the popularity of seaside photographs grew, Sunbeam expanded to other towns along this part of the East Kent coast including Westgate, Cliftonville, Broadstairs and Ramsgate. It’s possible they expanded by taking over smaller businesses. Certainly there were other operators in some of these towns, with W. P. Dobbs, Remington’s Fotosnaps, J. Easton Snaps and Walker’s Holiday Snaps operating in and around Margate in the 1920’s. Sunbeam also opened in Folkestone, with a photo office on the promenade ‘near the fish market’. At their peak they employed up to 300 people, many on a seasonal basis. The company started using large format cameras and glass plate negatives, then moving to paper negatives using long rolls which took up to 100 postcard size images. Colin Harding at Bradford Media Museum has figures which suggest Sunbeam could take around 35,000 walking images on a busy Bank Holiday before the war. Every hour the rolls would be collected by car and taken back to the labs for processing. The paper negatives would be developed, rephotographed using the same sort of paper negative, to produce a positive print. The finished prints would be taken out to a Sunbeam kiosk (there appear to have been several, including one cut into the rock at Palm Bay in Cliftonville) and by producing your paper slip with the reference number the following day, you could see and purchase your photograph. You could also order further copies by post later, though we have no details of how Sunbeam archived the originals or for how long. At first reference numbers were scratched into the glass plates, then done in ink, but in-camera negative numbering systems were later fitted with a letter which identified the photographer and his pitch. Sunbeam’s main office (and lab?) was at 82 Sweyn Road, and they also had a shop round the corner at 156 Northdown Road. At some stage (pre 1953) they had a big lab at Rosedale Road. In 1957 the firm was charging 2/- for a postcard print (or 2/9d for two half postcard prints – on a postcard). They offered enlargements up to 8″ by 6″, and even prints ‘finished in solid water colours’, which may mean hand coloured postcards. The company moved on to offer small colour walkies in the sixties at 5/-. During the off-season, Sunbeam concentrated on more traditional studio portrait work, as well as scenic photographs and material for newspapers. They advertised weddings photography, conferences, parties, school sports days, etc. Sunbeam also had large props including a donkey and a real stuffed tiger which were places in suitable locations and used for static portraits, often of children. The company was bought out in 1972 by LRC plc and then taken over by United Photographic Laboratories (based in Wiltshire) along with other labs owned by LRC in 1974, to streamline the amateur photographic processing trade. We do not know exactly when Sunbeam finished with the walkie trade but assume it ended during the 1960s. UPL closed the firm in 1975. Thanks to Max Warwick (former UPL director) and Margate Museum for additional information. The Museum has a collection of Sunbeam images of the area (though few walkies) and one of their donkeys! Sadly although the Museum was largely staffed and run by volunteers, Thanet Council shut it down in 2009. I don’t know how you get to see the material now, the Council put me in touch with the leisure department who have ignored my emails. Dane Packaging took over the Rosedale building in the 1970s and Tony Ovenden, an ex-employee, recalls all the developing machinery and boxes of old prints lying around, and was instructed to burn them. He rescued 1500 or so and gave them to local collectors. Thanks to Jane Audas for the ‘boy on a dog’ image. V332 shows Cyril, Joy, Gertie and Edgar Copley, about 1925, taken by Sunbeam at the same spot as the group of five on V7024 above. The kiosk image at the top appeared in Picture Post in 1948 and shows people waiting for it to open. Two more 1930s walkies, one by Sunbeam, on the site here. The Northumberland Hotel was situated in a prime position above Palm Bay. For many years my father, a professional vocalist, fronted the house band throughout the summer season and during other holiday periods. Together with my mother and sister I spent many happy times in and around Margate and Cliftonville. The family had many photos taken by Sunbeam and we still have some of them including those shot in the Hotel where a Sunbeam photographer was often on hand to capture special moments. Martin, on behalf of Northumberland Court residents, I’d be very interested to hear more and indeed see more of ANY pictures of The Northumberland Hotel, as well as Palm Bay. We now live in the former hotel and most of the records have been destroyed or dispersed as well as the pictures of how it was, the general layout, the exterior, especially the ballroom. It would seem the frontage probably is similar to how it was, perhaps also the front foyer. Do have a look at our website where I’ve captured as much information as I can. It would be great to hear from you and anyone else who has memories. We’d eventually like to create a little exhibition, one day. I have a picture that we found in our late aunts album. It was taken by Sunbeam Photos. Is there any way we can find out who it is. I’m putting together our family history. Would be so grateful if anyone could help me. I am Jack Worsell’s grandaughter. Jack Worsell was John Milton Worsell’s Son. Jack also helped run the business. Can anyone help me find some Sunbeam Photo’s or Memorabilia? Or any information on how to do so. Please email me through the site. Z7925 and is of my father’s sister, Dorothy Eleanor and her husband Jimmy with their daughter, Lesley. The other photograph shows Jimmy with Lesley on reins (now what happened to those to keep children from wandering off!). I don’t know if these are what you are looking for. Hi I am the grand-daughter of William Ground Wallis, he was a leading photographer for Sunbeam somewhere between 1919 through to the 1930s. He took many local photographs. I was informed by a local guy called Chris Fright, who also worked for Sunbeam as an apprentice, (that) many ended up in the Margate museum archive. However until recently before he passed away my father had many (I still have a few) but my father told me that to help raise some funds he sold or gave many to Frank Thorley, a local business man. I recognised quite a few of the prints on the walls in Thorley pubs. Hi Pauline. I did hear that some Sunbeam images were saved. However the local authority have closed the museum at Margate (even though it was largely set up and staffed by volunteers) and the Leisure Department responsible cannot be bothered to answer any of my emails, so from this far away it’s not possible to find out any more. These pictures will not be walkies, but the more regular images of the area and events which Sunbeam took. I may be one of your distant cousins, I used to stay in my summer holidays as a child with Dorothy and John Milton Worssell. I also spent a lot of time with Suzanne and I think her sister’s name was Jane. I may have some old photo of Suzanne and myself. My father Jack had a brother called Richard, I think his wife was called Joan but am not sure. They had a baby called Richard. If I can help please send me email. Regards Irene. I have come across a dozen or so of these Sunbeam Photo Ltd. ‘walking’ photos in a number of photographs left by my late mother. I guess they are dated around 1920/1930. Each bears a reference, I am keen, if at all possible, to identify who is featured in these photos – at least one in each has to be a relative. Is it possible to link references to names of those in the photos? Nick, the photographers did not take the names of their subjects. The reference numbers were just to help link the negative and print to the customer’s ticket. So there is no way to identify the people on the card from these sadly. If you are able to loan the images for the archive that would be great. very nice page on sunny snaps! as i keep buying them at postcard fairs mostly of london, speedy snaps are walkies so new to us both! ive just got a fantastic sunbeam of a giant felix toy standing on a childs model plane! hope your book comes out soon! I have a Margate postcard of my Dad’s cousin sitting on the prom. with the beach in the background, taken around 1928 and numbered 51092 in the bottom left hand corner. I have just found several family photographs taken in Margate by Sunbeam around about 1935, including one of my late mother standing on a toy donkey as well as one on a live donkey. Each photo has a clear number on it. They are really a piece of history. I have a Sunbeam Postcard in fairly good condition. It’s a photograph of my parents visiting the seaside from London and almost certainly taken between 1935 and 39. They are walking briskly, both looking at the camera. The obverse is blank except for the Sunbeam name and address, etc. Yes, be great to see this Derek. Would you like to send me an e-mail address and I’ll send you JPEGs? (I cannot see how I can upload images here). I have a photo of what I believe to be my great great grandfather and his four children taken by Sunbeam. My great grandfather died in 1931, and his father must have died before him, as there is no mention of his father in his obituary (which is quite long). I’d be very interested if you could help me date the photo. I’ll need to see it Tracy! I have a Sunbeam photograph (Margate) of a lion tamer looking like a young Marlon Brando in a circus cage sitting with six lions. I’d like to hear from anyone who can throw some light on the photo. Possibly a travelling circus or a retired lion tamer? I hope he got to see his retirement! I would need to see the image before I could comment! I recently found an old (1960s) photo of my grandmother and some other ladies at the seaside. Sunbeam Photos could just be seen in the background of the photo so I Googled to see if I could find out where the photo was taken. The photo was almost certainly Kent or south coast but could have been Southend-on-Sea. I was delighted to find some information on this site to help with dating – and just so interesting.